Paul Put, the new Harambee Stars coach has urged for patience as he prepares for his maiden assignment with the team at the CECAFA Senior Challenge beginning this weekend. Put was appointed to take over the team a fortnight ago and has already taken charge of five training sessions with a group of local based players. He says there has been so much progress made over those five sessions, not much can be expected for the Senior Challenge Cup. He promised that the team will fight to win the title, pointing out playing at home will give the side an advantage. “In football everything is possible but you have to be realistic. We have been in training for five sessions and those are not enough days to prepare for a tournament. But we play at home which is a motivation and winning is what I want. If it doesn’t happen, don’t blame anyone because we have to be patient,” Put who took Burkina Faso to the African Cup of Nations final in 2015 noted. He maintains his main target is to see the country qualify for the 2019 African Cup of Nations in Cameroon. Kenya started the qualification campaign on a wrong footing having lost away to Sierra Leone. The next match is in September 2018 at home to Ghana. “That is the big target of course and my focus is on the AFCON in 2019. It is very important that this tournament will give me a good opportunity to look at the players and understand their technical and tactical ability,” Put said. 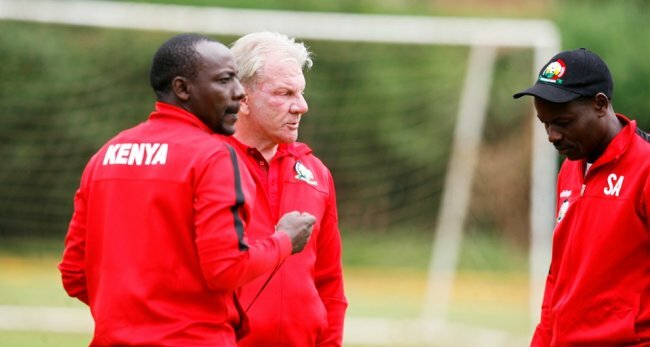 Football Kenya Federation has said the target set for the Belgian coach in his maiden assignment is winning the tournament, a repeat of the 2013 edition when the tournament was held in Nairobi. “Even before he was appointed, that was the target. Of course we know that his target is 2019 but we would want to win this tournament at home and we have asked him to try and win it,” Nick Mwendwa, the FKF boss said. Put expects a tough outing especially at the group stages where they will battle out with African Nations Championship (CHAN) destined sides Rwanda and Libya as well as Tanzania and Zanzibar. “Libya and Rwanda have a lot of quality players and noting they are playing in CHAN next year means they will bring a strong squad. I expect it tough from all the teams but it is good also so that I can compare the quality of my players,” he said. The top two teams from each group qualify directly to the semi-finals. Kenya opens its account against Rwanda’s Amavubi at the Bukhungu Stadium in Kakamega on Sunday. The opening ceremony will also be held there. The coach is already impressed with several players from the local based players team who he says will earn places in the senior team. He plans to have two friendly matches in March and June with the foreign based players as well to establish a good base ahead of Ghana’s qualifier. “Technically and tactically here is a lot which we need to do. But from what I have seen I have a good feeling. The players want to work and learn and improve themselves and I hope in the coming days we will be able to bring a good team which can make Kenyans happy,” the coach noted. At the same time, Put has named his final squad of 23 players which includes four players making the national team cut for the first time. The defensive trio of Bernard Ochieng (Vihiga United), Charles Momanyi (Kakamega Homeboyz), and Isaac Kipyegon (Zoo Kericho) as well as Thika United midfielder Said Tsuma have all earned places in the final squad. Tsuma and Kipyegon were late call ups, replacing Kenneth Muguna and Harun Shakava respectively. Immediate former Ulinzi Stars striker Stephen Waruru, Sony Sugar’s Benjamin Mosha and Nzoia United’s Lawrence Juma have been dropped from the initial squad of 26. Elsewhere, Burundi and Ethiopia have already touched down ahead of the tournament and headed straight to Kakamega. Burundi arrived on Wednesday night while Ethiopia touched down Thursday mid-morning. Both teams connected flights to Eldoret from JKIA from where they travelled on road to Kakamega. Goalkeepers: Boniface Oluoch (Gor Mahia), Patrick matasi (Posta Rangers), Gabriel Andika (AFC Leopards); Defenders: Musa Mohammed, Wellington Ochieng (Gor Mahia), Jockins Atudo (Posta Rangers), Dennis Sikhayi (AFC Leopards), Charles Momanyi (Kakamega Homeboyz), Bernard Ochieng (Vihiga United), Isaac Kipyegon (Zoo Kericho), Wesley Onguso (Sofapaka); Midfielders: Duncan Otieno, Whyvonne Isuza (AFC Leopards), Ernest Wendo (Gor Mahia), Chris Ochieng (Mathare United), Ovellah Ochieng, Patillah Omotto (Kariobangi Sharks), Said Tsuma (Thika United), Samuel Onyango (Ulinzi Stars); Strikers: Kepha Aswani (Nakumatt) Massoud Juma (Kariobangi Sharks), George Odhiambo (Gor Mahia), Vincent Oburu (AFC Leopards).